ESPN has further bolstered the college sports offerings on ESPN+ with a new, multi-year agreement with Conference USA. The digital deal will deliver more than 175 C-USA games to fans each year, including more than 125 combined football, men’s and women’s basketball games, with more than 100 of the total games on ESPN+ and the remaining games on ESPN3. 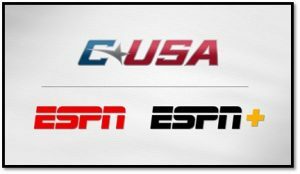 In addition, ESPN’s digital platforms become the primary home of multiple C-USA Conference Championships, while also adding exclusive early round men’s and women’s basketball championship action. ESPN+ — the first multi-sport, direct-to-consumer subscription streaming service from The Walt Disney Company Direct-to-Consumer & International segment in conjunction with ESPN — continues to add to its college sports programming. This now includes live sports from numerous college athletics conferences, including the America East, Atlantic 10, Atlantic Sun, Horizon, Metro Atlantic, MAC, Missouri Valley, Southland, SoCon, Sun Belt and The Ivy League. This season, 45 Conference USA football games will be available on ESPN’s digital platforms, with 32 streaming on ESPN+. Among the games carried on the subscription service are the home openers of UAB, Charlotte, Marshall, Middle Tennessee, Rice, Southern Miss, Western Kentucky, and Louisiana Tech and eight conference games in the season’s final three weeks. The addition of C-USA games adds to the more than 100 exclusive games available on ESPN+ this season. Conference USA men’s and women’s basketball will expand their presence on ESPN’s digital platforms under the new deal, with more than 85 regular season games available each season and exclusive coverage of both conference championship’s first rounds. ESPN’s digital platforms will also spotlight additional Conference USA Championships throughout the year with special highlight shows. Among the sports expected to be featured include cross country, indoor and outdoor track and field, swimming and diving, golf, and tennis.